Google AdWords is easily one of the best marketing platforms to have ever existed. But just because something good doesn’t mean it couldn’t be better. Google is constantly improving their ad offerings to make it easier to target the right audiences and to make it easier for people to buy items they see in ads. Google has announced several upcoming updates to AdWords to make the network more powerful than ever. While most changes from Google require website owners to modify their sites to take advantage of the new feature, one of these updates will happen automatically. Some of the biggest changes will come with ads served on YouTube (which is also owned by Google). In fact, almost half of the U.S. population (47 percent) says that YouTube helps them when making a decision about something to buy at least once a month. 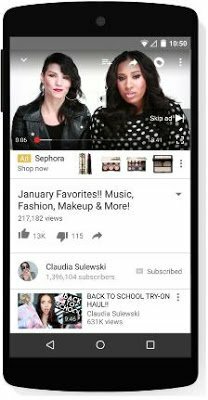 Earlier this year, Google introduced TrueView for shopping to improve revenue and conversions from YouTube ads. Thus far, the program has worked well, with Google reporting great results. There has been a 50 percent increase in the number of advertisers using the product January. Furthermore, in recent weeks, about a third of YouTube advertisers utilize this format every week. To capitalize on these gains, Google is introducing a new Companion Banner. They’re adding a new interactive banner appearing next to video ads. This is beneficial because it allows viewers to scroll through products while the video is playing next to it. The banner also shows viewers the most up-to-date product information. This will benefit retailers by making it easier for consumers to quickly convert from the ads they seen. The new Companion Banner has a product picker feature that lets advertisers easily choose and prioritize which of their products are featured as cards in a TrueView for shopping campaign. This is an optional feature so advertisers can choose specific products for specific campaigns, or they can continue to let the format dynamically feature products from their Merchant Center. Each method of selecting products for TrueView has advantages and disadvantages. Retailers may want to try specific products but if the results aren’t great, let Google dynamically pick the products. There are algorithms are pretty good and they may be able to identify opportunities that the retailers may have otherwise have missed. Google is also launching a tool that can help business owners take advantage of consumer trends that are seen in the data from big retailers. Google is also releasing a new Retail Micro-Moments Guide and Travel Micro-Moments Guide. This will provide retailers with data from brands like Best Buy, William’s Sonoma, Swarovski, La Quinta and Booking.com. Business owners and retailers should take a look at these new tools from Google to see how to best use them in their own marketing. And for more news about online marketing, read this article on a study comparing Amazon and Google as starting places for searches on product information.